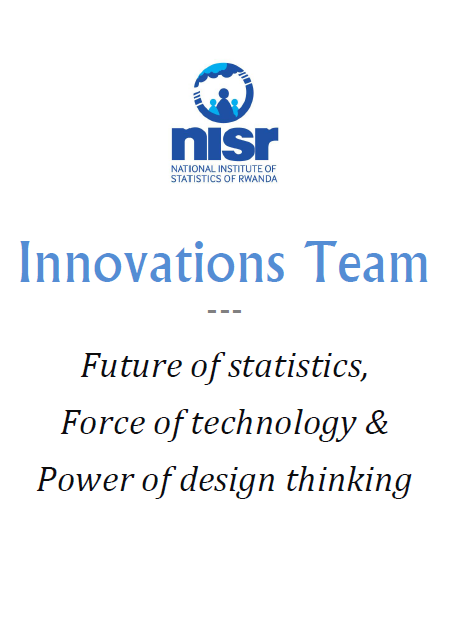 The Innovations Team (Lab) formally came into existence at the National Institute of Statistics of Rwanda (NISR) in May, 2014. Since then, the following poster, enunciating the ambitious nature of the enterprise – ‘Future of statistics, Force of technology & Power of design thinking’ – has adorned the entrance of the space accommodating a group of five. Not a common practice at NISR, but boldly displaying the name and the game of the team at the entrance, has served well as a constant reminder not only to the other teams and units at the institute, but also to the members of the Innovations Team itself, to reinforce the point that there lies a pioneering effort which marks the public institution’s foray into the world where design thinking, iterations and use of modern technology in serving the data user, are the new normal. Globally, there is a trend gaining momentum for public institutions to dabble in innovations, trying to improve public service delivery through novel means. To get a sense of the scale of this ubiquitous trend of innovation labs inside government, check out this searchable global map done by Nesta [In the map, there are about 100 labs represented and are color coded for the level of government (blue for local, green for regional, red national and yellow international]. In Rwanda, arguably NISR could be called a forerunner. Looking back, I think, the idea for a team like this at NISR was brewing organically for some time. The strongest sign of that, could be traced to the successful design and development process of the 2nd National Strategy for the Development of Statistics (NSDS2) [NSDS is a comprehensive and formal approach to strengthen the national statistical systems, and eventually improving availability, quality and accessibility of data for guiding policy, monitoring progress, measuring results, and supporting analysis in a country]. In early 2013, when the preparations for NSDS2 (2014/2015-2018/2019) were being mulled over at the institute, it was decided to constitute an internal ad-hoc team for the undertaking. Composed of one intern (Emile NSHIMIYIMANA, now, the Financial Account Portfolio Statistician at the institute), one statistician (John KARANGWA who till recently worked with the institute as the Principal Statistician for Civil Registration and Vital Statistics System) and one publications designer (Jean-Claude NYIRIMANZI, Team Leader in charge of Research, Publication and Documentation at the institute), I led the team. This was innovative, because the normal practice was typically in favour of specialized teams. The recognition, that creating an effective multidisciplinary group, facilitating idea generations at the interface of disciplines – as an essential prerequisite for developing a strategic perspective towards a multi year development plan for the field of data and statistics in the country context – was completely new! The NSDS2 came out in record time and received accolades, from many quarters, such as the below mentioned tweet, by Amanda Glassman, who is a co-chair of the Data for African Development Working Group (which, recently released the report – Delivering on the Data Revolution in Sub-Saharan Africa, in the context of post-2015 UN development agenda and related – data revolution). But, innovation need not be a sudden jolt all the time. The ‘new’ could be an incremental improvement too! The Infographic Competition at NISR is a case in point. It was a simple idea back then (Nov, 2012), which started with the intention to improve engagement with the statistical user community. It took roots however gradually and more broadly (with untiring efforts of Ruben MUHAYITETO, the Data Portals Management Officer and others at the institute) at the intersection of – data dissemination, open data, analytics and data visualization – responsibilities, typically concentrated in different organisational units. 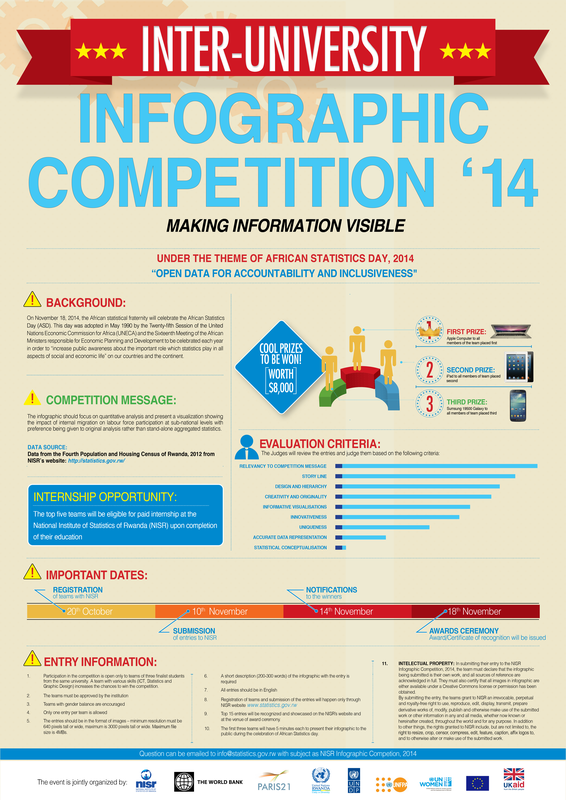 Marking the 3rd iteration, the 2014 Infographic Competition (poster below), now stands on the platform of porous boundaries, encouraging mix and match of skill sets appropriately. Creating awareness and developing capacities for innovation. Building partnerships and networks fostering collaborations. Instilling research competence and incentive in the processes. Facilitating organisational environment and building support for innovation scale-up. Observing and understanding data-seekers’ actions and hypothesizing the reasons for their interaction outcomes with NISR. Applying innovations to engage with data-seekers through outreach and dissemination activities. Leveraging on modern technologies, exploiting the most powerful trends in statistical development. Transforming the National Statistical System (NSS) for coordinated response to data-seekers’ needs. In one sense, with the setting up of the Innovations Team, it was, in fact, a ‘scaling-up’ of the innovations at NISR in its own right. Five full-time staff drawn from different departments/units to sit together and work as a team, included two from the NSDS2 design team. Today, as the lead technical advisor of the Team, the challenge before me is not only to bring the focus that innovations deserves in the institutional setup like this, but to use this opportunity to institutionalize innovations for long-term impact and results in statistical development. I must say that it is a very good idea. In the first NSDS for Côte d’Ivoire we introduced a unit (service d’ingéniérie) much less innovation oriented, focused on advising operational units on designing and improving processes, censuses or surveys; the main issue was the relationship with heads of departments within INS and also with heads of statistical units outside INS. The idea was to concentrate high level expertise and disseminate it to support the core production processes; it flailed partly because the allocated human resources were coveted by main departments and partly because of the silo culture within the organisation and the NSS (not to mention partners). So my main questioning is on the balance between advising the departments, with management backing, and the power to enforce recommended changes (the Team’s authority beyond technical expertise). Being a project unit proving of concepts is not too much of a problem. The relationship with another units that would be in charge of quality assurance is also a point to consider, because of obvious overlaps.